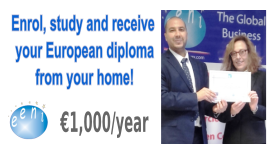 Syllabus of the Online Course (Subject): European Union-Morocco Association Agreement. Learning materials in or Unión Europea-Marruecos Maroc-Union européenne Marrocos-União Europeia. 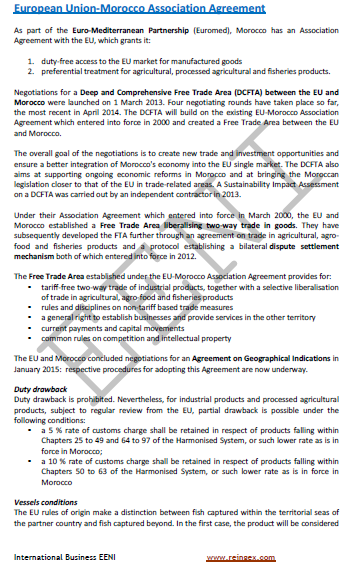 Morocco has an Association Agreement with the EU within the Euro-Mediterranean Partnership (EUROMED) framework. One of the objectives of the EU-Morocco Association Agreement is to achieve the progressive Trade Liberalisation in goods, services and capitals as well as the creation of a free-trade area between the countries of the European Union (Germany, Austria, Belgium, Bulgaria, Croatia, Cyprus, Denmark, France, Slovakia, Slovenia, Spain, Estonia, Finland, Greece, Hungary, Ireland, Italy, Latvia, Lithuania, Luxembourg, Malta, the Netherlands, Poland, Portugal, the United Kingdom (BREXIT), the Czech Republic, Romania, and Sweden) and Morocco. Duty drawback within the European Union-Morocco Association Agreement is forbidden. Tolerance: 10% of ex-works price (excluding textiles and clothing). Type of cumulation: diagonal, complete and bilateral. The European Union-Morocco Association Agreement belongs to the European Economic Area (Western Civilisation) and the Islamic Civilisation.